﻿Scientists have made advances in understanding the process involved in the progression and spread of Parkinson's disease (PD) within the brain. The study, published in eLife, focused on understanding the process that drives the disease's progression by mapping the distribution and degree of atrophy, characteristic of the disease, in certain brain regions and identify the paths leading the spread from affected to healthy tissue. The researchers had access to an unprecedented number of MRI scans and clinical data through the open source Parkinson's Progression Markers Initiative (PPMI) database. Thanks to this wealth of data, researchers were able to analyse MRI scans which show the structure of the brains of 230 people in the early stages of Parkinson's disease and compare them to those from age-matched healthy individuals. 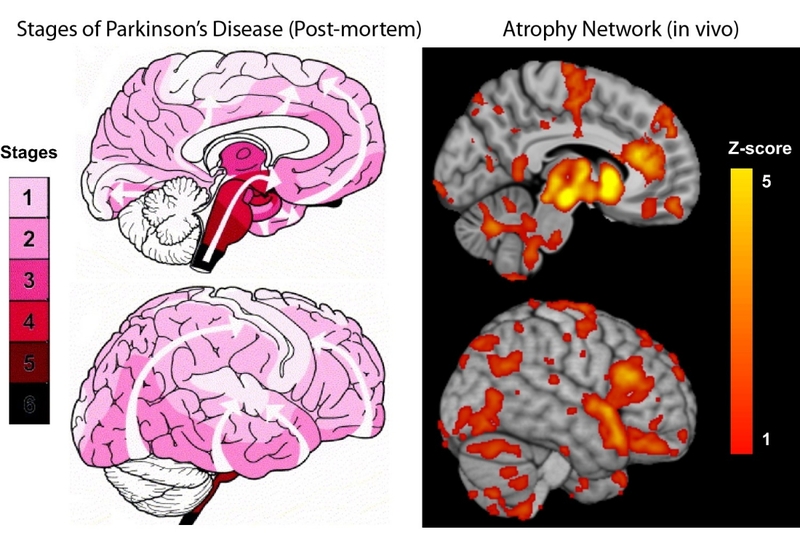 This allowed them to identify the set of brain regions that show atrophy in the early stages of the disease. "The atrophy pattern on MRI is compatible with a disease process that spreads via brain networks - something that had never been shown in human patients before, and would support the hypothesis that PD is caused by a "toxic agent" that spreads trans-neuronally," the researchers said. The findings add new evidence to the hypothesis that brain cells in Parkinson's patients might deteriorate according to a prion-like mode of disease propagation, in which a toxic agent spreads from brain cell to brain cell utilizing the normal connections of the brain. Similar mechanisms have been proposed for diseases ranging from Alzheimer's Disease to Bovine Spongiform Encephalopathy. The process would involve the spread of alpha-synuclein, a toxic misfolded protein with the ability to make copies of itself and infect neighbouring cells while traveling through the brain's neuronal highways. The patients who were enrolled in this study will continue to be evaluated on a yearly basis providing researchers with more data to continue mapping how the disease progresses throughout the brain and furthering our understanding of its causes. Current treatment options help control or minimize symptoms including tremors, slowness of movement, stiffness or rigidity, and loss of balance. The findings of this study hold exciting therapeutic implications. In the longer term, it will help researchers develop new techniques to assess the efficacy of drugs that could target the culprit protein and might eventually lead to treatments that will prevent, slow, halt or even reverse the progression of PD. Based on material originally posted by McGill University Health Centre.